Patients are often pleasantly surprised to learn during their initial consultation that our practice does not require patients to shave their heads for a follicular unit strip surgery (FUSS) procedure. As Coalition hair restoration physician Dr. Carlos Wesley operates on only one patient per day, it is much easier to take the time to carefully navigate around the pre-existing hairs during recipient site creation. The benefit to hair transplant patients occurs not only in the immediate short term, (7-10 days) post-operatively when the redness can be better camouflaged by the longer native hairs, but also during the first few months of early hair growth when the transplanted hairs are just beginning to grow and provide coverage and density. Here is an example of one of our patients whose pre-existing hair helped camouflage the redness and the stubble for the short-term postoperative period after hair transplant surgery. 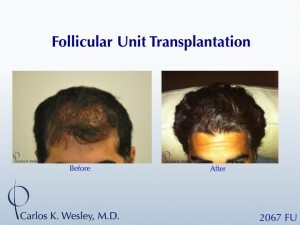 For more of Dr. Carlos Wesley’s patient results view the discussion, “Why we don’t require shaving the recipient area: Dr. Carlos K. Wesley (NYC)” from our hair loss forum and social community.